I’ve always rather loved those 1960s’ bubble chairs. They manage to look simultaneously comfy, oddly cool and kind of scary. Okay, maybe I’m just easily alarmed, but I have a suspicion that if I ever managed to get into such a chair I’d only get back out by some sort of falling. Getting in or out would at very least result in a degree of ungainliness, I’m sure of that. The comfy part is all about the way the chair envelops its occupant, of course. So what could make such a chair both more comfy – maybe, I’m not completely convinced on that one – and more scary? Why coating it, inside and out, with what appear to be breasts made out of old tights, of course. 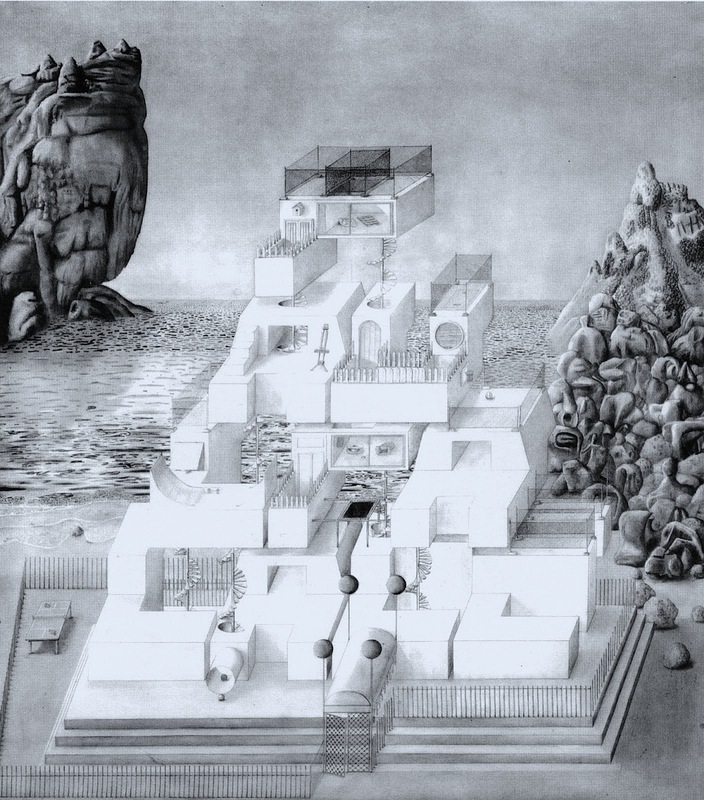 The Spotlight section of Frieze Masters offered a fascinating reminder of the art that was being made in the 1960s and ’70s and, in particular, of the women artists whose work is gradually gaining greater recognition. It’s not just women artists whose work doesn’t really become known until much later of course, but I don’t think it’d be hard to make the case that it happens disproportionately to women (one would hope that this is no longer the case, but that’s something that only time will tell). 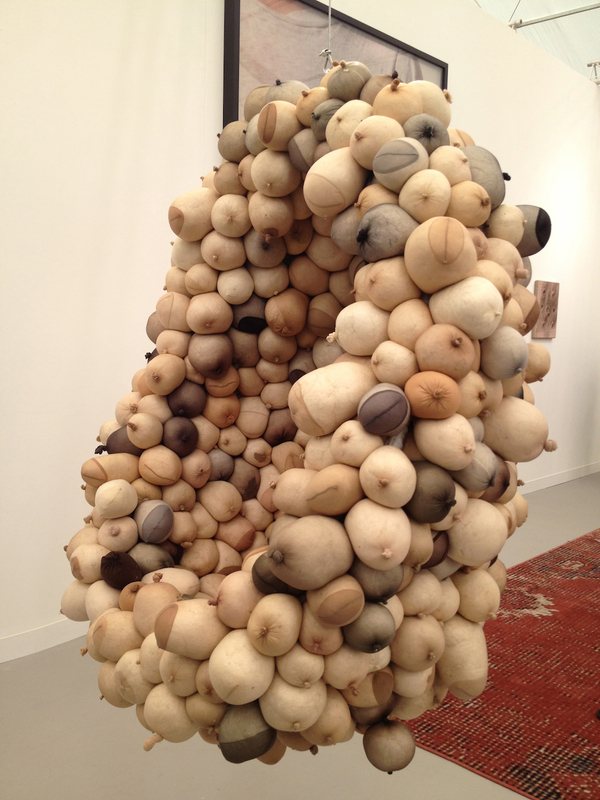 Of Birgit Jürgenssen’s work, shown by Galerie Hubert Winter, it’s a small sculpture that has stayed freshest in my mind. 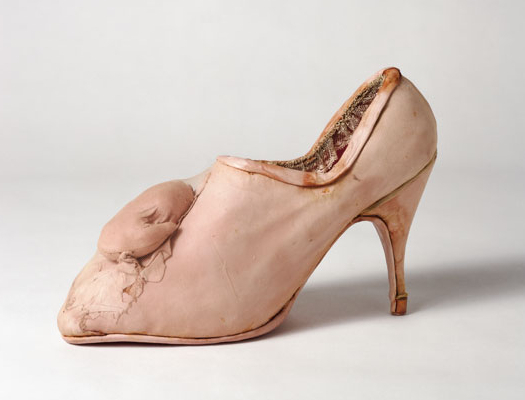 Pregnancy Shoe is a strange object; there is a similarity of approach perhaps with Louise Bourgeois’ use of fabric – and thus the shared approach of using materials and processes often seen as ‘feminine’ to make feminist work that comments on women’s place in society – and with the surreal nature of the work. Though the show appears to be pregnant, it’s unclear quite what it will actually give birth to. 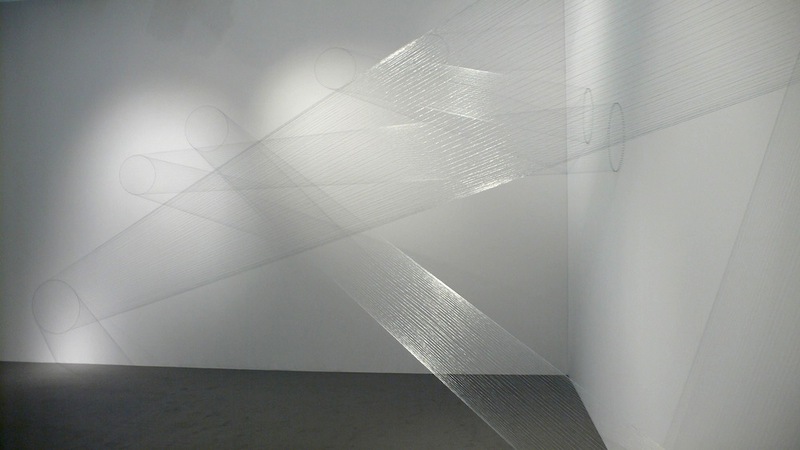 I’ve written about Lygia Pape’s web installations here before, I know, but having seen her exhibition at the Serpentine Gallery last spring seeing Ttéia 1 again – albeit a slightly different, silvery, version – in the Galeria Graça Brandão space of Spotlight at Frieze Masters was a welcome chance to interact with the work in a rather different way. Here too, the light catches the thread and makes it sparkle and standing in front of what seem to have become criss-crossing beams of light carries the same sense of enchantment. 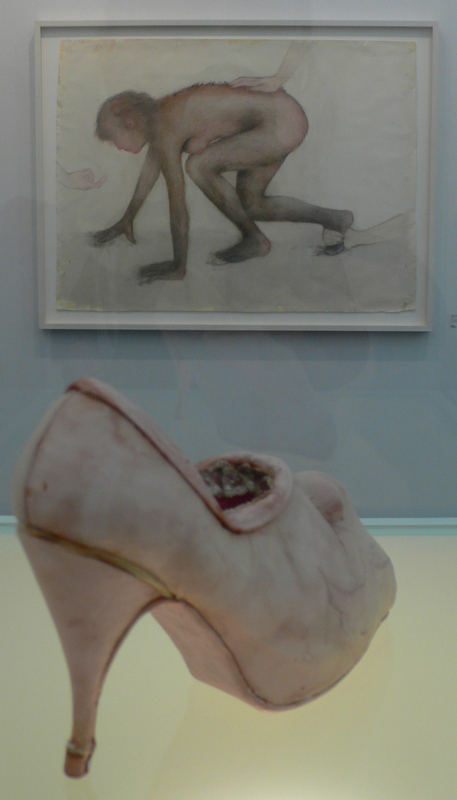 But whereas in the Serpentine Gallery the work was effectively put on a pedestal (albeit in the form of a slightly raised floor), as something to wonder at rather than interact with, here it simply criss-crosses a corner of an art fair stall. At some point, all children copy adults. Admittedly, this doesn’t usually take the form of restaging a parent talking about their work, but that’s the basis of Hetain Patel’s To Dance Like Your Dad, a simple but effective video work shown at Frieze by Chatterjee and Lal. Shown on two screens, the work consists of Patel’s father showing us round his place of work and explaining what happens. Patel himself appears on the right hand screen, performing his father’s role in sync with the original. The parent and child relationship is seldom simple and while we may be fiercely proud of our parents they also have the capacity to embarrass. Here there is a sense of pride and respect in the act of restaging – and in filming Patel senior at work in the first place – but the notion of potential embarrassment is right there in the title. Dad dancing is generally not a good thing, after all. Thinking back at work seen over the past few months obviously brings Frieze Art Fair back to mind and thinking about Paul Noble’s work in the Turner Prize 2012 exhibition has made me think about sculpture by someone who I mainly associate with two dimensional work, all of which brings me to Gillian Wearing. 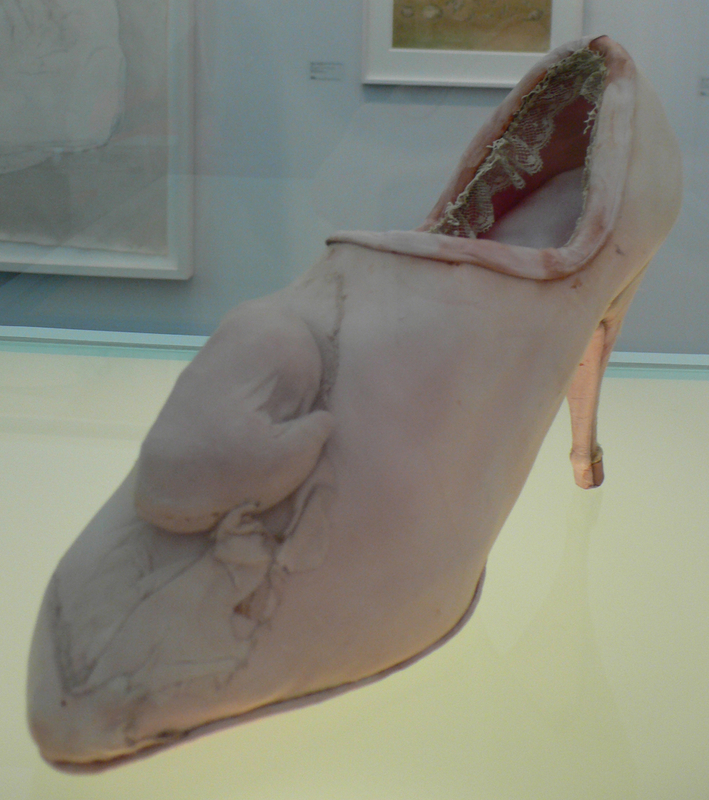 I’ve written about Wearing a couple of times on this blog (about her work with the confessions of others and the works for which she becomes other people) but I haven’t mentioned her sculpture, in the main because I find it less interesting, I think. 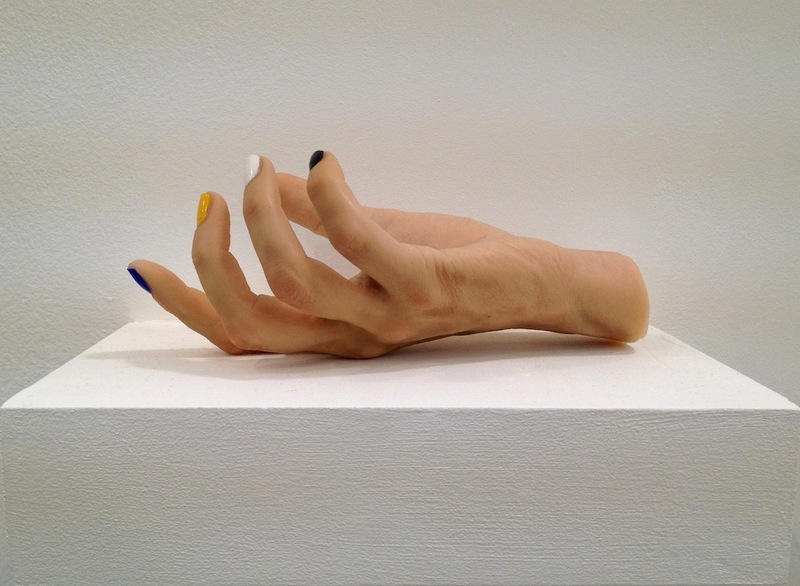 Nonetheless, My Hand, shown at Frieze by Maureen Paley, has stayed in my thoughts for some reason and I now find myself wondering why I find this piece engaging. When the Turner Prize shortlist is announced I generally have an opinion about who I want to win. When the actual Turner Prize exhibition opens, even before I get to see the show myself, that opinion often changes based on snippets seen on the news or reviews in the paper. And of course when I finally get round to seeing the show, more often than not my opinion shifts yet again. By then there are often two names in my head: the artist I want to win and the one I think will take the prize. In a way, from the safe distance of not having seen the exhibition yet, I really wanted Paul Noble to win the 2012 Turner Prize, not for the work on show at Tate Britain but for the preposterous totality of the Nobson Newtown project: two decades, give or take a bit, of incredibly detailed drawings of an often dystopian world populated by strange turd-like creatures (as a description that does somewhat beg the question of quite what a utopia for turds would look like but this isn’t something I plan to consider further, or certainly not here). How time flies! When I was a student at the Royal College of Art it celebrated its centenary. That the college is now celebrating its 175th anniversary either means that I am a lot older than I thought or that the powers that be at the RCA can’t count. Or that they really like big birthdays. As it turns out, it’s this last option that sees the college celebrating 175 years as an art school a mere sixteen years after celebrating its centenary: the then Government School of Design was founded in 1837, becoming the National Art Training School in 1863 and the Royal College of Art in 1896. 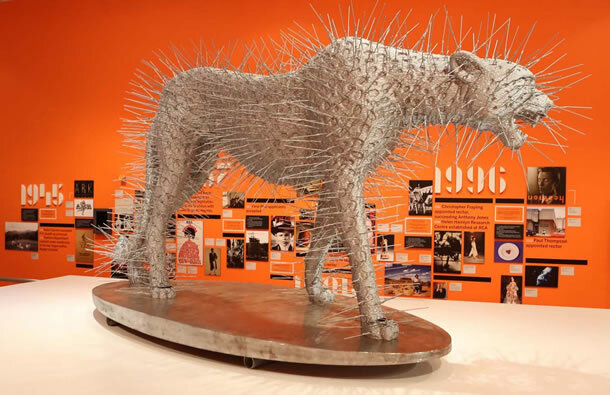 The exhibition charts the history of what is apparently the world’s oldest art and design school in continuous operation and it’s an illustrious and fascinating history. Given the pool of alumni (and staff, past and present) from which the curators could select work, there were always going to be surprises both in terms of inclusions and omissions but this is a show that amply demonstrates the impact of RCA alumni on our cultural and day to day lives.